The former speaker of the NYC Council tried to tone down her statements in which she called Nixon "unqualified" while also misidentifying the bi actress as a lesbian. 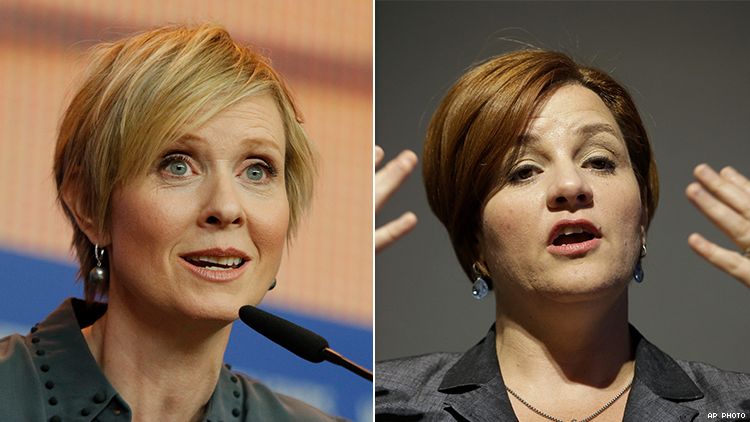 Out actress and activist Cynthia Nixon's run for governor of New York has drawn a flurry of praise, criticism, and internet memes, with some of the criticism coming from another high-profile out New Yorker, former New York City Council Speaker Christine Quinn. Nixon announced her bid for governor Monday; she'll run in the Demcratic primary against incumbent Andrew Cuomo. She released a video that emphasized her areas of concern for the state, such as fixing mass incarceration and New York City’s “broken” subway system, and addressing health care. Now Quinn, an out lesbian who became one Nixon’s most pointed critics, has explained comments calling Nixon “unqualified” while also bringing Nixon’s sexuality into it and misidentifying her as a lesbian. Nixon, who is married to and raising children with Christine Marinoni, identifies as bisexual. Following Nixon’s announcement, Quinn slammed Nixon for actively campaigning against her when she ran for mayor of New York City in 2013 against Bill de Blasio. At the time of her mayoral run, Quinn had been the first out person to act as speaker of the New York City Council, serving two terms in the position. Online response to Quinn’s statement was fast and furious, not just because Quinn called Nixon “unqualified,” but because she bi-erased the actress. In a series of tweets Tuesday, Quinn attempted to clarify her inflammatory statement to the Post. While Quinn lashed out against Nixon’s bid for governor, Nixon is on the record saying that while she didn’t support Quinn's run for mayor, she had nothing against her. “I’ve got to say, I’m not anti-Chris Quinn. I worked alongside her in the marriage fight, and I believe she was incredibly eloquent and incredibly effective. But apart from that particular gay issue, I don’t see a lot of stuff where I line up with her,” Nixon said in 2013. A devoted activist for LGBT and women’s rights and for public education, Nixon — a spokeswoman for the Alliance for Quality Education — caused a stir regarding her identity in 2012 when she called herself “gay” and implied that sexuality is a choice before identifying as bisexual. Nixon was in a long-term relationship with English professor Danny Mozes prior to her relationship with Marinoni, and she has two children with him.